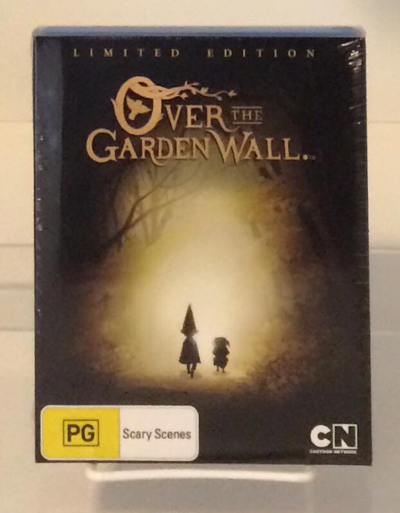 The shop’s lone arrival today was the Australian limited edition release of Pat McHale’s “Over the Garden Wall,” an animated miniseries featuring the voices of Elijah Wood, Melanie Lynskey, and Christopher Lloyd. The series is split into 10 episodes, each lasting 12 minutes, which aired on Cartoon Network (the show’s producter) in November of 2014. “Over the Garden Wall” tells the story of two brothers, Wirt and Gregory, who get lost in the woods while making their way home. Early on in their adventures the boys encounter Beatrice, a grumpy talking bluebird (played by Lynskey) who becomes an advisor of sorts as they pass from one fairy tale-like scenario to the next. Among the extras included in the set is “Tome of the Unknown,” the show’s pilot.